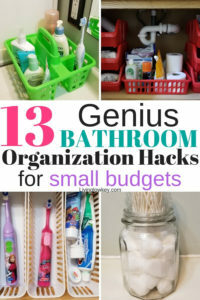 The best bathroom organization ideas for $1! 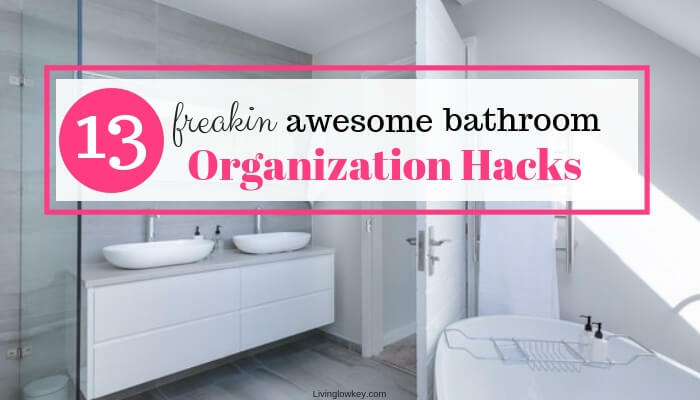 Are you looking for inexpensive ways to organize your bathroom? So was I, so I came up with a solution! A cheap one at that! 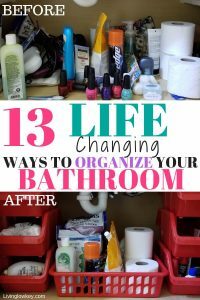 Believe me, you don’t need a bigger bathroom or MORE space for the best bathroom organization ideas to work. All you have to do is get creative with the storage space you already have an make a quick trip to the Dollar Tree! Let’s get the party started with these easy organization ideas for your bathroom, from the Dollar Tree! The “BEFORE” picture above was what my bathroom cabinet looked like before I bought some awesome $1 bins from the Dollar Tree. This transformation literally took less then 10 minutes! 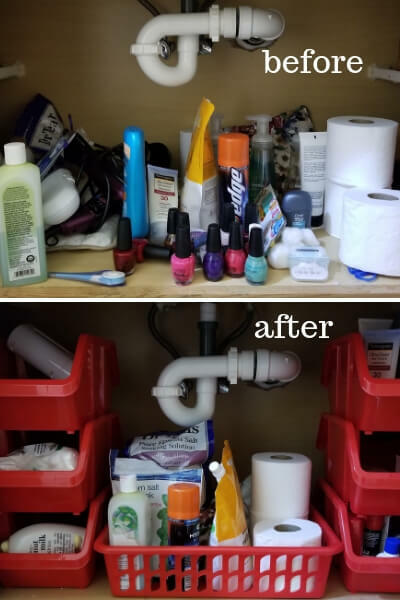 If you’re looking to organize your bathroom cabinets and get rid of some unnecessary clutter under your sink, go pick up some stackable bins and transform your space! The Dollar Tree has all kinds of different colors to choose from. Better yet, check out these awesome baskets to organize your space. They are on my dream list! 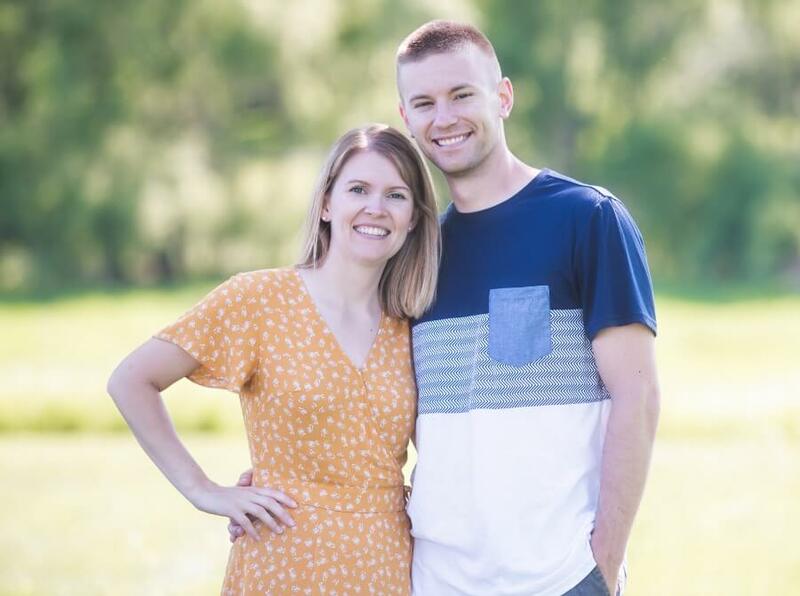 If you want to see other essentials I buy at the Dollar Tree to save me the BIG BUCKS, check it out HERE! You're so close! 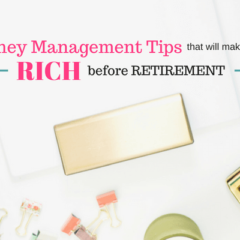 Just check your inbox to confirm that you still want these awesome tips! 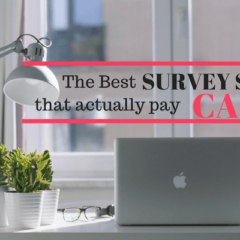 Once you confirm you'll receive your 10 free tips instantly. Looking to keep clutter from piling up on your bathroom sink? Use a small caddy for all of your must-have essentials. Keeping all of your necessities in one area will keep your sink looking neat and organized! Does anybody’s toothbrush drawer resemble the one in the picture above?? Mine definitely didn’t! That is until I got my hands on these baskets. Best of all I scored 3 of these little baskets for $1 at the Dollar Tree. 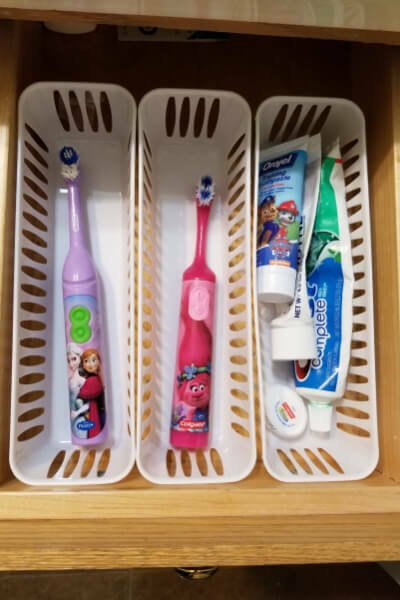 These tiny little baskets will help you organize your drawers so you don’t have toothbrushes and tubes of toothpaste EVERYWHERE. 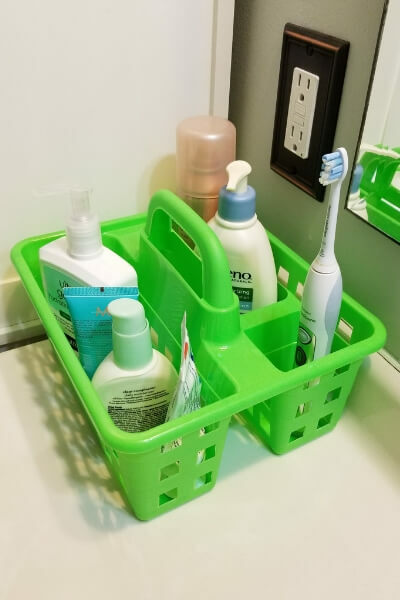 These baskets are a must if you have lots of people sharing one bathroom. All 4 of us share one bathroom and we all use different toothpaste.. Does anyone else struggle with this problem? These baskets are a life saver!! Sick of stepping on toys in your shower? 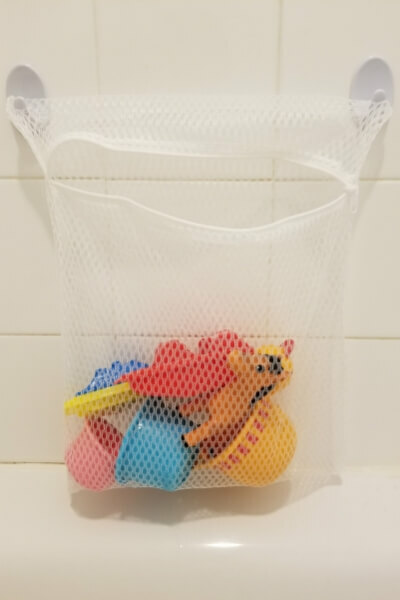 So I created this super simple toy bag for the bathtub. Best of all it only cost $2. 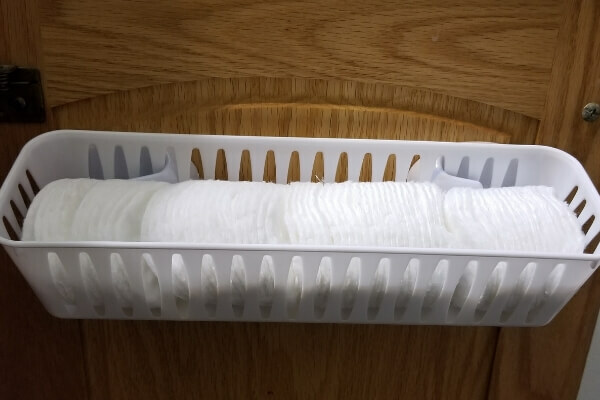 Head over to the Dollar Tree and grab yourself a mesh washing bag. The kind you throw your undergarments in before putting them in the washer. Grab some command hooks (also available at the Dollar Store) and stick it to your tub or shower wall. Then fill with toys! Looking for a unique way to organize your bathroom essentials? Head to the Dollar Store and pick up a mason jar and shot cup. 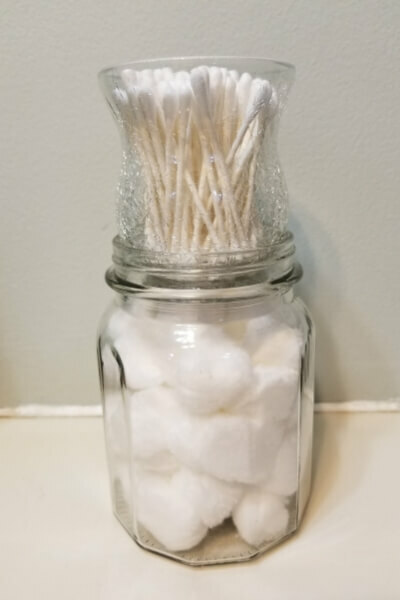 Stack them on top of each other for awesome storage for your cotton balls and q-tips. This is a fun way to display items in a master or guest bathroom. You can also get crafty and paint your jars to match your bathroom! 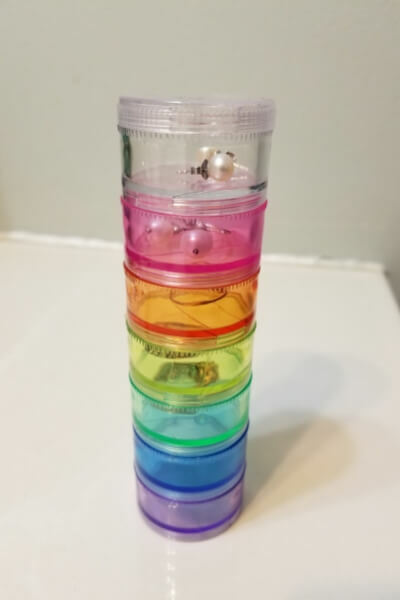 Grab a colorful pill organizer and turn it into a fun way to store extra jewelry and other small items in your bathroom. This is great way to store extra jewelry out of site, without losing them. 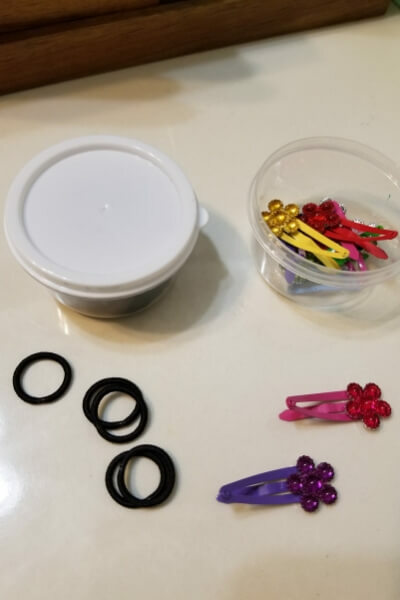 If you have kids they’ll love storing their little hair accessories in these. These pill organizers are also a great way to store earrings, necklaces, and rings when traveling. 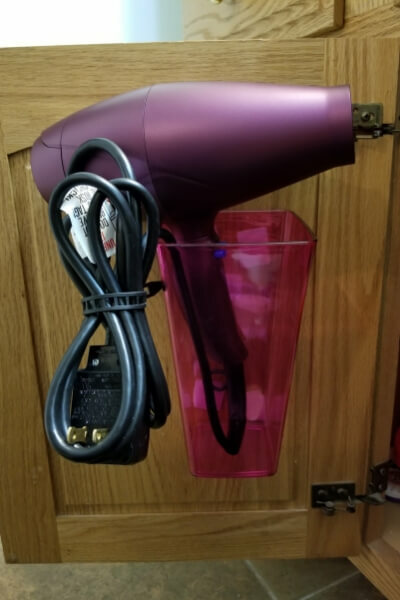 Want an easy way to store your hair dryer? Grab a $1 cup and some double sided velcro (both can be found at any Dollar Store). Put the double sided velcro on the cup and stick it inside your bathroom cabinet. 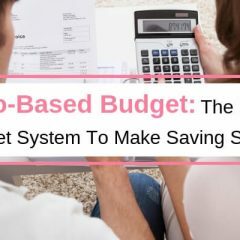 This is such a quick and easy organization hack! It also frees up a lot of space under my sink. 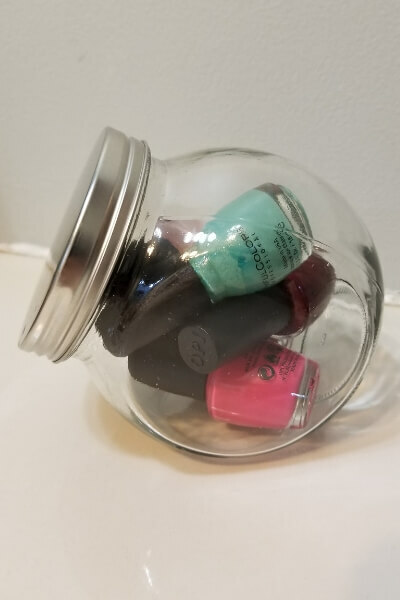 Grab a few of these cute glass containers to create an easy storage solution for your nail polish or other bathroom essentials. Glass containers add such a nice touch to your bathroom whether you are looking to display them on your counter or hide them under your cabinet. These cute little storage containers come in a pack of 10 at the Dollar Tree. If you are looking for storage in your bathroom these are a MUST! You can use these for everything from ponytails, to barrettes. The sky is the limit! Are your pony tails scattered throughout the bathroom? 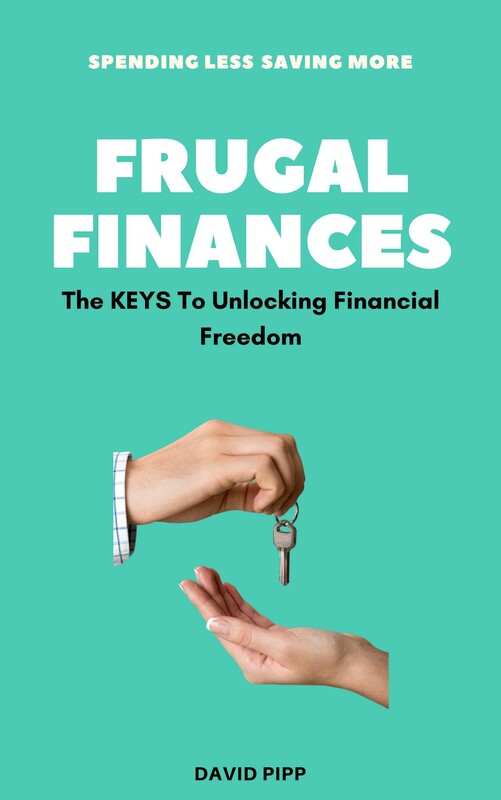 Then you are going to love this hack! Buy a pack of shower curtain hooks for $1. Use one and slide all of your ponytails on it. Here are 16 other ways to use shower curtain hooks! This is a neat way to add more storage to your bathroom. You can’t beat this kind of storage for only a dollar! I had leftover command strip from hanging mesh toy bag in the shower so I used it to hang this beauty in my cabinet. I love having my bathroom counters clutter free. With the help of this rack, I can do just that! 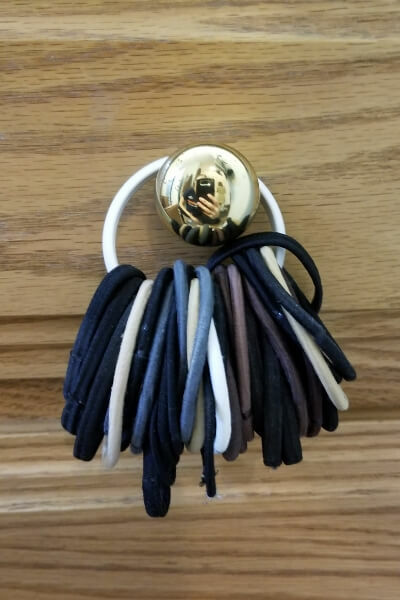 You can also use this to hang on your shower head. If it doesn’t fit on your shower head use and command strip to hang it in your shower! Here is a great list of things to BUY and what not to buy at the Dollar Tree! I’m super excited to share this little dollar hack. This is actually how we store our toothbrushes in our camper. Grab 2 command hooks and a little storage bin. At the Dollar Tree you can score 3 of these for a dollar. 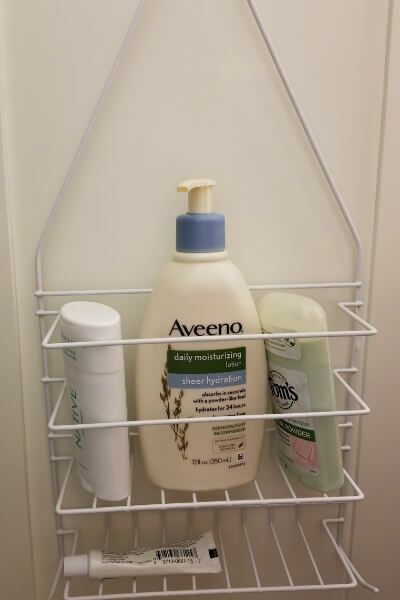 Hook the command hooks onto the inside of your bathroom cabinet horizontally then hook on the basket. I currently store cotton face pads in mine but the possibilities are endless! We all love having things organized in our lives. 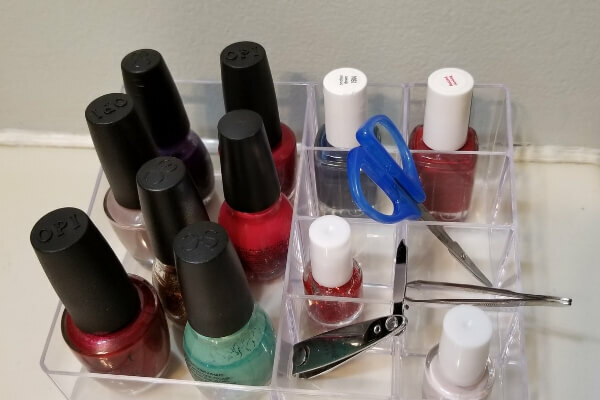 I grabbed a few of these clear plastic organizers from the Dollar Tree to help organize a few leftover stragglers that were under my sink. And I love it! Online these plastic organizers cost a LOT! Well, not at the Dollar Tree! They are actually extremely well made, I was very surprised with its quality. 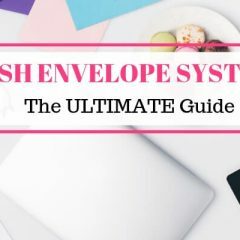 If you enjoyed this post pin it for later!